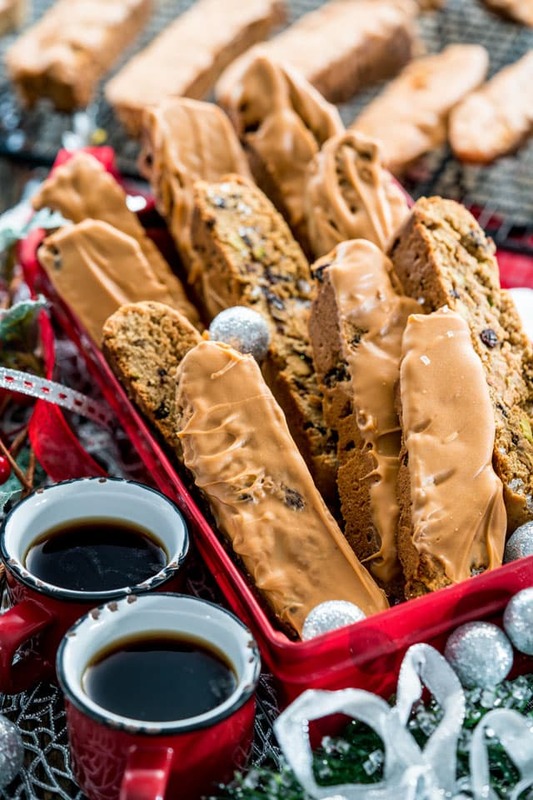 These English Toffee Gingerbread Biscotti are spiced up with lots of ginger, all spice and loaded with pistachios and currants, then dipped in English Toffee! Perfect for your morning cup of joe! Welcome to my 12 Days of Tasty Treats! Starting today and over the next 12 days, I will share with you a new recipe every day for a tasty treat that you can make and share with your friends and family this holiday season. But that’s not all! 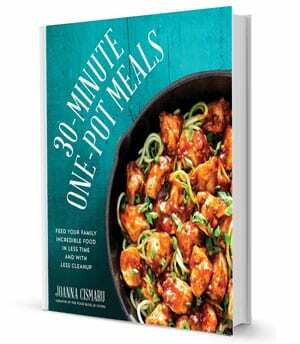 During these 12 days of Tasty Treats I will also be hosting the biggest giveaway ever on Jo Cooks. All I can say is that it’s a KitchenAid product that rhymes with mister. Yeah, I think you can guess what that is! I’m not going to tell you when the giveaway starts, you just come back every day and check out these awesome and delicious tasty treats. As usual, I would love to hear from you if you try any of them. So let’s talk biscotti, shall we? Ever make them? I know you’ve had them, they’re perfect with your morning cup of joe. But ever wonder how they’re made and how they get to be so hard and chewy yet perfectly crunchy? The secret is that you bake them twice, which is what the name biscotti actually means, “twice-baked”. You shape the dough into 2 rectangles, bake them for 22 to 25 minutes, let them cool, cut them then bake them again for a few minutes and voila! They really are super easy to make. 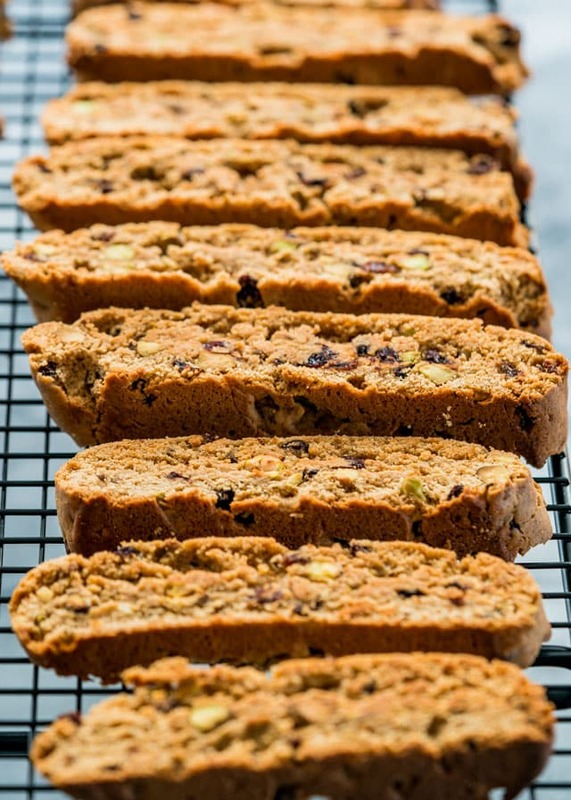 But being the holiday season and all, I made you all a gingerbread biscotti that’s spiced with loads of ginger and all spice, then I loaded them with pistachios and currants. If that’s not enough for you, I then dipped them in English Toffee candy melts. So good! 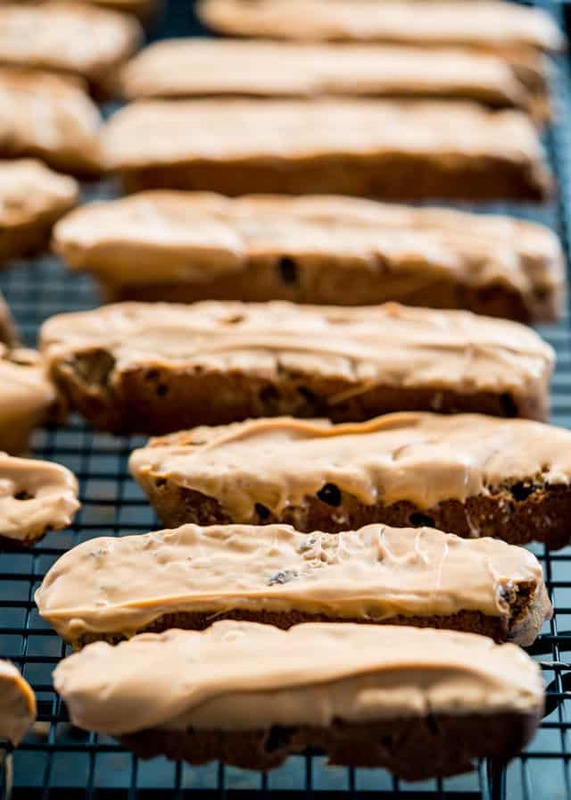 Try my Chai Chocolate Chip Biscotti for another amazing morning time treat! Go ahead and make these now because you can freeze them, just take them out the day you’re ready to serve them, thaw them out on your kitchen counter for a couple hours then enjoy. I froze mine too, but I immediately pulled some out of the freezer to have with my coffee, so good luck with them lasting till Christmas. I hope you come back and check out the rest of the tasty treats and enter the giveaway contest! You won’t regret it! In a large bowl add the butter, sugar, brown sugar, ginger and allspice, then beat on medium until well combined. Add the eggs and mix until well combined. Add the molasses and continue mixing for another 30 seconds until well mixed. Add the flour, baking powder, salt and beat on low until well mixed. Stir in the pistachios and the currants. Transfer the dough onto your work surface and divide the dough into two pieces. Shape each half into a rectangle that's about 10 inches in length and about 4 to 5 inches in width. Flatten each piece slightly. Place the logs onto a cookie sheet, making sure there's a couple inches in between them. Bake for 22 to 25 minutes or until lightly browned around the edges and the tops are cracked slightly. Remove the baking sheet from the oven and let it cool for about 15 minutes. Reduce the oven temperature to 325 F degrees. Transfer the logs to a cutting board and using a serrated knife slice them diagonally into 1/2 inch to 3/4 inch slices. Place the slices, cut-side down back onto the baking sheet. Bake for 9 more minutes, turn the cookies over and bake for another 7 minutes. The cookies should be crispy at this point. Transfer to a wire rack and cool completely. Add the English toffee candy melts to a medium size bowl and microwave for 1 minute. Stir using a spatula, then place in the microwave for another 30 seconds. Stir again, it should be melted and smooth, if it isn't, place it in the microwave again for another 15 seconds if needed. 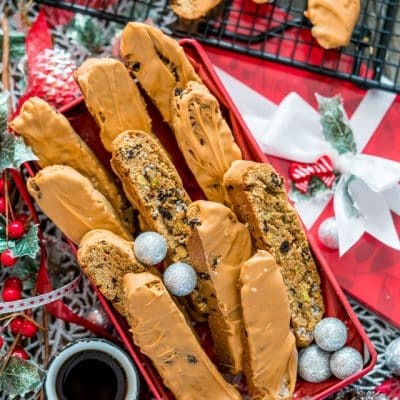 Dip each biscotti cut side down in the English toffee, and lay back on the rack with the candy side up. Repeat with all the biscotti. Let them set at room temperature until the candy coating is firm. You can use any type of nuts or dried fruit that you like best for this recipe. Alternatively, you can leave them out completely if you'd like. 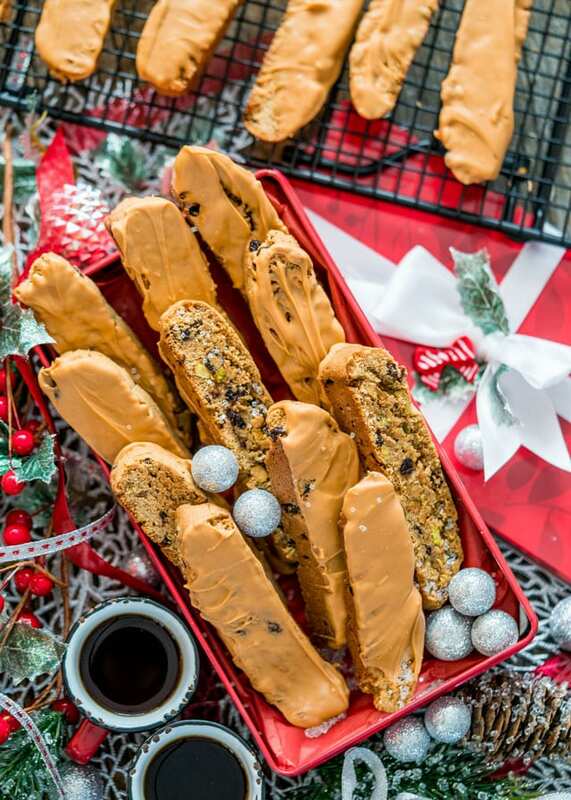 To freeze, place biscotti in an airtight container and place in the freezer for up to 3 months. I found the English Toffee candy melts at Michael's, but you can use chocolate chips instead, same technique, melt them in the microwave until smooth then dip the biscotti in it. You can do cranberries! They’re sour, of course, so you can chop them up and toss them with a bit of sugar if you’d like. You forgot to mention adding the eggs in the recipe instructions..
You’re right, thanks for catching that. Recipe has been updated. I have just started following your recipes. They are delicious and easy. My husband used to hate the experiment night, but with your recipes, no problem. Thanks. Thank you so much, Donnell. Let me know what else you try, I’d love to hear about it. I love the way these look! Two questions for you. Can I eliminate the currents? The second is where did you get the English Toffee Melts? 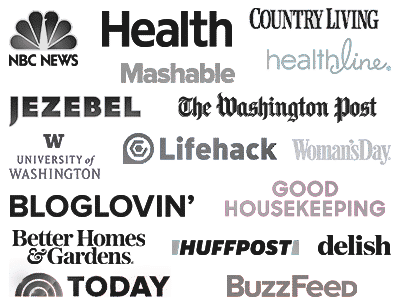 I always love all your recipes and have made many of them. Thanks and have a wonderful holiday season. Yes, you can definitely eliminate the currants or replace them with something else. I mentioned in the recipe notes regarding the English Toffee Melts, I found mine at Michael’s but you can use chocolate chips or white chocolate would be great, whatever you like and can find. I was reading my Women’s World magazine I had tucked away for Sunday night after all my baking was done and I happened to come across a page of your recipes!!!! I was so pleasantly surprised and happy to see them in there. I don’t know if I missed the announcement about it but congratulations! I’m actually excited for more of your cookie recipes as my Dad told my Mom to “make something different this year, no tarts.” (Butter tarts with raisins are his favorite). I can’t wait to try these. Ive never seen Toffee Candy Melts. Where can they be purchased?